A view of the Adelaide plains looking South towards the Adelaide Hills. The Torrens River at night with the Torrens river footbridge illuminated. Adelaide Oval during a cricket match with the Adelaide Oval scoreboard to the left and St Peter's Cathedral to the right. Henley Beach, one of the beaches along the Adelaide coastline of the Gulf St Vincent, with the Henley Beach Jetty in the background. Adelaide is a city in Australia. 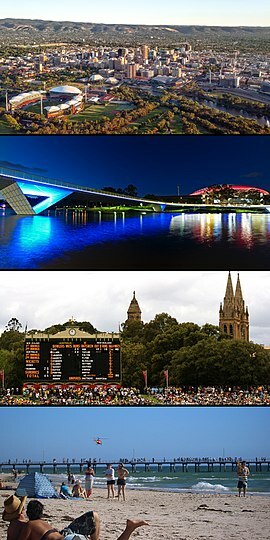 It is the capital city of the state of South Australia, and it has an approximate population of 1.2 million people. It is the fifth biggest city in Australia, behind Sydney, Melbourne, Brisbane and Perth. Adelaide was founded in 1836 by Colonel William Light, who named it after Queen Adelaide. 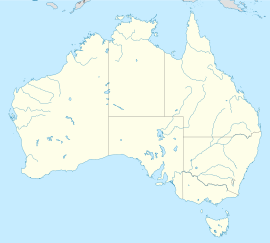 Adelaide is near the Southern Ocean and is north of the Fleurieu Peninsula. It has a river going through it called the River Torrens. Many festivals are held there. Adelaide has a hot-summer and cool-wet-winter Mediterranean climate. Grapes for wine production are grown in the Barossa Valley about 50 kilometres (30 miles) northeast of Adelaide, in the McLaren Vale about 30 kilometres south of Adelaide and parts of the Mt Lofty Ranges to the east. This page was last changed on 20 March 2019, at 20:15.